A conversation with Prof. Richard Lindzen | Watts Up With That? I also provided the solution to an old question about tidal oscillations in surface pressure. For tides that are forced by the gravitational force of the moon, it has been known since Newton that the dominant period should be 12 lunar hours. However, at the surface, the pressure oscillates primarily at 12 solar hours though solar forcing is primarily thermal in origin and dominated by 24 hours. The question was why the observed tide was semidiurnal rather than diurnal. I showed that diurnal tides were trapped over much of the earth and suppressed. There was also the interesting fact that at the mesopause (ca 85 km) the winter pole is the warmest place and the summer pole is the coldest place. I showed that this was caused by the breaking of small-scale waves from below. The behavior of the atmosphere and oceans provides many interesting puzzles and I always enjoyed these puzzles. Grégoire Canlorbe: You have sparked vehement reactions, in highlighting how futile the popular claims on increasing droughts, floods, hurricanes, tornadoes, sea level rise, and other extremes. Even modest warming, you say, should not be considered a genuine threat to human health and agriculture. Could you remind us of the data invalidating climate doomsday scenarios? Richard Lindzen: I should point out that I don’t personally do much work in these areas, nor do I think that the ‘vehement’ reaction is primarily to my statements concerning extreme events. The time history of such matters as droughts, floods, hurricanes, tornadoes and temperature extremes is well recorded by official bodies like NOAA, and display no systematic increase. Indeed, some, like hurricanes, appear to be decreasing. These trends have been documented by R. Pielke, Jr. (https://www.amazon.com/Rightful-Place-Science-Disasters-Climate/dp/0692297510/ref=sr_1_fkmr0_1?ie=UTF8&qid=1492721355&sr=8-1-fkmr0&keywords=pielke+jr+in+books), and even the IPCC has acknowledged the absence of significant associations with warming. I have occasionally noted that theoretically, warmer climates should be characterized by reduced temperature extremes. The attempt to associate present weather extremes and other matters ranging from obesity to the Syrian Civil War, with climate change is frequently hilarious (http://www.numberwatch.co.uk/warmlist.htm). The mostly non-scientist proponents of climate hysteria realize that distant forecasts of remote problems by inadequate models are unlikely to motivate people to shut down modern industrial society. They, therefore, attempt to claim that we are seeing the problems right now. Of course, the warming that has occurred over the past 200 years or so, has been too small to have been a major factor. However, objective reality matters little when it comes to propaganda – where repetition can effectively counter reality. The issue of sea level rise is slightly different. The proponents of climate alarm have for almost 40 years recognized that massive sea level rise and coastal flooding provide excellent graphic examples of dangers that people can react to. Such things as a couple of degrees of warming are much less effective in frightening people. Of course, carefully analyzed tide gauge data shows sea-level increasing about 20 cm per century for at least 2 centuries – with no sign of acceleration to the present. The claim that this increase is accelerating is very peculiar. Tide gauges don’t actually measure sea-level. Rather, they measure the difference between land level and sea level. At many stations, the former is much more important. In order to estimate sea level, one has to restrict oneself to tectonically stable sites. Since 1979 we have been able to measure sea level itself with satellites. However, the accuracy of such measurements depends critically on such factors as the precise shape of the earth. While the satellites show slightly greater rates of sea level rise, the inaccuracy of the measurement renders the difference uncertain. What the proponents of alarm have done is to accept the tide gauge data until 1979, but assume that the satellite data is correct after that date, and that the difference in rates constitutes ‘acceleration.’ They then assume acceleration will continue leading to large sea level rises by the end of this century. It is hard to imagine that such illogical arguments would be tolerated in other fields. Grégoire Canlorbe: It is commonly admitted that temperature increases follow the rise in atmospheric CO2 levels—and not the other way around. In this regard, fossil fuels emissions are easily believed to be the most plausible origin of contemporary increasing CO2 levels. Do you question this dogma? Richard Lindzen: I’m not sure what you are saying. In point of fact, increasing CO2 should cause some warming, but increasing temperature can also increase CO2 (for example CO2 follows temperature during the cycles of glaciation). That said, it is not unreasonable to claim that the observed increases in CO2 over the past two centuries are mostly due to fossil fuel emissions, cement production, and land use changes (i.e., man’s activities). The question is can this increase in CO2 produce much in the way of climate change. Increases in CO2 have produced about a 1% perturbation in the earth’s energy budget. This impact was so much smaller before around 1960, that almost no one (including the IPCC) claims the impact was significant before that date. Even a 1% change is no greater than what is normally produced by relatively small changes in cloud cover or ocean circulations which are always carrying heat to and from the surface. Observationally, one would have to see changes since 1960 that could not otherwise be expected. According to the IPCC, models find that there is nothing competitive with man-made climate change, but observations contradict this. The warming from 1919-1939 was almost identical to the warming from 1978-1998. Moreover, there was an almost total slowdown of warming since 1998. Both imply that there is something at least as strong as man-made warming going on. Grégoire Canlorbe: You have been spearheading the iris hypothesis, according to which increased sea surface temperature in the tropics does result in reduced cirrus clouds and thus more infrared radiation leakage from Earth’s atmosphere. After nearly two decades of polemics, how do you assess your theory? Richard Lindzen: I’m not sure what you mean by ‘spearheading.’ In 2000 I published a study of upper level cirrus behavior in the tropics as a function of surface temperature (together with two colleagues at NASA). As you note, we found that the areal coverage of tropical cirrus (which result from the detrainment from deep cumulus clouds) does decrease with temperature, and that this effect was sufficient to more than cancel the commonly assumed water vapor feedback which is essential to predictions of high climate sensitivity. There immediately followed a series of papers that criticized our work. Each of these criticisms was easy to dismiss, and we did so in published responses. However, subsequent papers inevitably referred to our paper as ‘discredited,’ and never referred to our responses to the criticism. However, the fact that upper level tropical cirrus shrinks with increasing surface temperature has been confirmed in several subsequent papers. Moreover, since the water vapor feedback is only relevant in the absence of upper level cirrus, one cannot actually separate the iris effect from the water vapor feedback. The combined feedback is more accurately referred to as the long-wave (i.e., infrared) feedback, and direct measurements confirm that this feedback is zero or even negative. Interestingly, there is a problem called the ‘Early Faint Sun Paradox’. This refers to the fact that about 2.5 billion years ago, the solar constant was about 30% less than it is today, but the evidence is that the climate was not greatly different from today’s climate. My student, Roberto Rondanelli and I showed that the simplest explanation was the iris effect. In summary, the iris effect still seems eminently viable. Grégoire Canlorbe: In the field of the sociology of scientific knowledge, an intriguing claim on your part is that eugenics offers the closest historical parallel to the anthropogenic global warming theory. Could you expand? Underlying both issues were political aims: control of the energy sector for AGW and immigration for eugenics. In the early 1920’s, it was argued in the US that America was undergoing an epidemic of feeblemindedness due to immigrants from Eastern and Southern Europe. With respect to AGW, a highly oversimplified description of the greenhouse effect was put forward as the scientific basis; with respect to eugenics, a comparably oversimplified picture of single gene heredity was employed. In both examples, numerous prominent individuals endorsed the issue, claiming that the science was obvious, and, in both cases, the scientific community failed to object. The panic over the ‘genetic’ implications of the ‘epidemic of feeble-mindedness’ led to the Immigration Restriction Act of 1924 that closed America’s doors to many people fleeing the Nazi’s. Grégoire Canlorbe: In a mediatized letter you wrote to President Trump, you urged him to withdraw from the UN convention on climate change. Do you think the hype around man-caused climate change has turned out to be a mere propaganda tool to develop the UN into a global government with a Malthusian agenda—as many voices on the Right seem to worry about it? Richard Lindzen: Actually, the hype around man-caused climate change serves many agendas – of which global governance is but one. As I pointed out many years ago, almost every interest except that of the general public has figured out how to profit from this issue. The interests, ironically, include the fossil fuel industry. Grégoire Canlorbe: French President Emmanuel Macron has steadily pushed for climate change action, anxious to lead the resistance against Trump’s climate-realist policy—as well as his economic nationalism and his foreign policy positions. Do you envision a rollback of the Trump era for the world? Richard Lindzen: Once again, I’m not sure what you are asking. The silly support for this issue by people like Macron, Merkel, and Pope Francis has little impact in the US. I suspect that most ordinary people realize that this is a phony issue, and it has been clear in the US that Trump’s lack of concern for this issue has not been a political problem for him. Grégoire Canlorbe: The belief in regulating carbon emissions (to prevent global warming) is often thought of as a secular revivification of Paganism. Yet the surviving nations of the classical pagan world are generally those disbelieving in man’s sin towards nature—and escaping this totalitarian religion that is hard ecologism. Neither China nor India substantially endorse climate alarmism, let alone denuclearization and green energy. How do you make sense of this? Richard Lindzen: It is probably inaccurate to refer to China and India as Pagan. However, such factors as the breakdown in the prominence of Christianity in the West has provided an opening for other bases for belief and virtue. I have to admit that I don’t think replacing the Ten Commandments with ‘watching one’s carbon footprint’ has much long term potential. Grégoire Canlorbe: An ancestral debate focuses on the question to know whether mathematics is just a tool to know the physical reality, or refers to a suprasensible dimension beyond atoms and the void. As a lifelong atmospheric physicist, and a past master in elucidating the flaws of mathematical climate models, what is your feeling on the issue? Richard Lindzen: While mathematics is the language of the physical sciences, mathematics is not simply the use of arbitrary algorithms. This is currently pretty much the situation with climate modeling. Algorithms are used, but they do not represent valid solutions of underlying equations. The models lack the resolution to deal with fundamental aspects of nature – some of which are insufficiently understood to even know what equations to use. Grégoire Canlorbe: Thank you for your time. Is there anything you would like to add? This conversation of Prof. Richard Lindzen with Mr. Grégoire Canlorbe took place in Paris, in May 2018. Grégoire Canlorbe is not only Vice President of the Parti National-Libéral (“National-Liberal Party,” conservative, nationalist, and free-marketist), but a supporter of the Association des Climato-Réalistes, for which he conducted the interview. June 18, 2018 in Climate News. ← “What If India And China Used Natural Gas And Oil Like The U.S.?”… What a wonderful world it would be! This guy literally ‘wrote the book’ when I was in grad school. A national treasure. All too true. When I read Retraction Watch, and I hear about the crisis in replication in science, I’m always astounded how well “climate science” is insulated from what previously was considered science. Must just be luck, I guess. Excellent read. Thanks for sharing it. An extremely well-reasoned response to the climate hysteria being passed off as rational thought these days. Looking forward to responses from the doomsdayers that pop in from time to time. Excellent interview. Thank you, Prof Lindzen and thanks to you, Grégoire, for your sensitive journalism, unbiased and unaffected by the vagaries of MSM. An actual physical scientist of the air and sea, not a GIGO computer gamer pretending to be a “climate scientist”. Radiation Budget Experiment (ERBE) nonscanner data. in climate prediction. Citation: Lindzen, R. S., and Y.-S. He really has a way with words. I would call this one the friendly knock out. The simplest explanation for me of the “‘Early Faint Sun Paradox” is that Sea Level atmospheric pressure was higher earlier in Earth’s history and has slowly diminished, coinciding with a steady slow rising solar output. The molar ratios of the various gases have of course changed over billions of years of photosynthesis and geo-weathering. We use isotope proxies to reconstruct molar gas ratios, but I see no way to reconstruct from a proxy what Sea Level pressure was 2.5 billion years ago, as it would take very little % increase in pressure to make large temperature difference. Whether total pressure (and by direct extension, atmospheric mass) has diminished due to losses to space (mostly the light hydrogen split from water during photosynthesis) or by sequestration into crustal minerals via geoweathering and subduction, I don’t know, but probably both to some degree. Water can also be “reformed” (split to oxygen and hydrogen) by the high heat of crustal subduction of wet tectonic slabs melting. Furthermore, ablation of gases from the Top of the Atmosphere would be much higher during geomagnetic reversals. Under this early higher pressure hypothesis, there were likely times when falling pressure got ahead of increasing solar output, making for an increased likelihood of ancient snowball Earth periods and the emergence of the current Quaternary ice age where Malinkovitch orbital forcings came into play. An interesting hypothesis, are there any papers on it? The observational effect of higher atmospheric pressure and higher surface temperature plays out every day in computerized model weather forecasting. High pressure system = higher surface temps, Low pressure = lower temps. Forecasting surface temperature profiles boils down to predicting pressure patterns. Today’s 1 Atm = 1013.25 millibar = 101.325 kPa. Using a standard wet adibat lapse rate, we find that at 15 ℃, a +2 kPa / ℃. It changes slightly as temps move up and down, but not by much in the range of interest. And a dry lapse rate is almost half that, at around 1.2 kPa / ℃. A decent rule of thumb is then about a 2% increase in surface pressure would raise moist air surface temp by 1 ℃. Thus a 10% increase in standard surface pressure would raise expected temp by at least 5 ℃, and even more under a dry air adiabat. So if ancient Sea Level Air pressure were 111.4 kPa (1114 millibar, or 10% higher than today), then surface air temps roughly be 5 ℃ warmer. Problem: There is no known proxy that could resolve ancient Earth atmospheric surface pressure to +/-10% accuracy necessary to test the hypothesis. The UW researchers who studied South African fossil raindrops from 2.7 Ga determined that the atmosphere couldn’t have been more than twice as dense as now, but probably the same or even of lower pressure. Not precise enough, as you note. And of course they concluded that this must have meant lots of GHGs, without considering alternative explanations for anomalous warmth under a weaker sun. Perhaps there’s a problem with the Faint Early Sun hypothesis. What little (mostly lousy) data we have on the early Earth seems to show a fairly warm world most of the time and we can’t really explain how that’s possible.. Perhaps we should leave open the possibility that the theory is just plain wrong for some reason and the sun was mostly much warmer than Carl Sagan and Mullen hypothesized. It’s not like we have 4 billion years of careful measurements to work with. Thanks for the reference. Reading it I had to laugh. “Meanwhile, to get a measure of raindrop impressions under present-day atmospheric pressure, Som and Polivka used a pipette to release varying sizes of water drops down an open stairwell into recent volcanic ash collected from Hawaii and Iceland, held in a tray nearly 90 feet below. The ash was of similar composition to the rock in which the fossilized raindrop imprints were found. The scientists used liquid plastic and hair spray to harden the impressions, which then were scanned with lasers and the scans compared to the impressions from South Africa. Som determined that, if the biggest imprints were formed by the largest raindrops, the atmospheric pressure 2.7 billion years ago could have been no more than twice what it is today. Maybe if he’d gone to a big NASA air pressure tank, and dropped water drops at higher than 1 Atm pressures to create an empirical graph of droplet size vs air pressure, then I would have been impressed. But his (Som’s) rain drop size proxy error estimate range was basically a 2.7 Ga atmosphere somewhere between 1 Atm (1013 millibar) to 2 Atm (2000 millibar). And of course, he favored the lower estimate simply because it fit into his CO2 GHG bias. You’re welcome. You owe me for the laugh. The other experimental question is whether 90 feet is of sufficient height for a water droplet to reach terminal velocity? (actual rainfall drops achieve terminal velocity for sure). the formula for terminal velocity is V = ((2*m*g)/(ρ*A*C)). I have no idea what C would be. I’m sure someone knows though. And then with a terminal V, one could simply calculate whether 90 feet is sufficient to achieve that speed before hitting the ash-filled tray. Good question, to which I don’t know the answer. The drag coefficient may be subject to other considerations besides frontal area. Dry air might affect rate of fall differently from moist air, dusty from clear, etc. You’d think that in Seattle, they could just have left the “ash tray” outside to be rained upon any day during nine months out of the year. WR: In wintertime in Siberia, high pressure means minus 40 degrees Celsius. In wintertime Western Europe depressions mean rising temperatures (if compared to situations in which high pressure areas are dominating). I agree that in summertime the reverse is true in both cases. But, what if measured over a year??? I really don’t think the point about higher global sea level pressure, and thus higher atmospheric mass, would lead to higher global surface temperatures is controversial…. at all. I hate to use the word, but the consensus of atmospheric physics of a higher Earth atmospheric mass (molar gas ratios kept constant) would lead to higher temperature is a pretty solid understanding. I think the problem is in the use of the word ‘system’. High pressure systems and low pressure systems are in the present world used in a relative way: around the present average pressure. On a much different timescale you are looking at the total average pressure, which might have been higher than today’s. Thinking about the temperature in the Mediterranean basin when it fell mostly dry during the Messinian crises, we get an idea of the effect of an eventual higher pressure. At a depth of 2 kilometers temperatures must have risen at least 2000 : 100 x 0.6 = 12 degrees Celsius during the Messian crises. That must have stimulated evaporation. The NASA Mars Maven mission is specifically designed to answer questions about Mars loss of atmosphere. But Mars is a very different problem, due to lack of a long-term geomagnetic field to shield its upper atmosphere from solar particle ablation, and its much lower gravity than Earth. Losing hydrogen disassociated from water into space would have no impact on the density of the atmosphere. It would have an impact on how much water is in the oceans. The amount of water vapor found in the atmosphere is controlled independently by other factors. IMO, UV radiation from the sun broke down water vapor in Earth’s first atmosphere, producing hydrogen and oxygen gases. The former escaped to space and the latter formed ozone. Eventually, the solar wind blew this atmosphere away. The second atmosphere, made from volcanic gases, probably was denser than the third (with O2, thanks to photosynthesis), which of course includes ours today. Atmospheric pressure is probably lower now than previously in the Cenozoic. Deep time involved in Earth’s long evolution is hard to fathom. 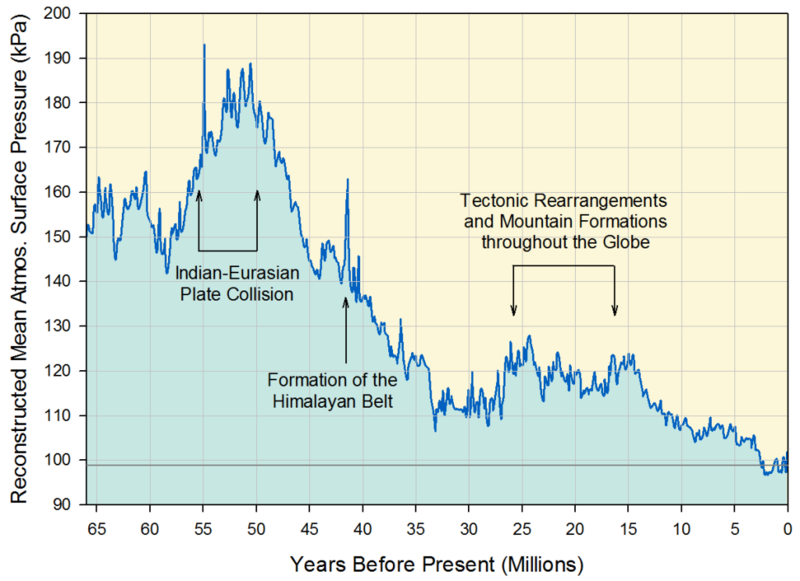 65 million years ago is 65/2,500 x 100% = 2.6 % or ~1/40th of the time back to 2.5 Billion years ago. Yup, the whole Cenozoic Era is a geological eye blink. And according to the so-called experts in the climate field, the period of time between the end of the Little Ice Age, roughly 1850 to present with its increase of temperature of roughly 1 degree C is a friggin eternity. Even the one degree is fake. More like half a degree, which was claimed in 1995. But since GASTA has been practically flat since then, except for El Nino spikes, the other half degree is Mann-made, not man-made. Any chance of you supporting the validity of the graph? The PDF of the Poster is a better copy. That link is to an OCR of poor quality, i.e. lots of spelling errors due to a bad OCR run. “Eq. (6) reveals an important characteristic of the average thermodynamic process at the surface, namely that a variation of global pressure due to either increase or decrease of total atmospheric mass will immediately alter both temperature and atmospheric density. What is presently unknown is the differential effect of a global pressure change on each variable. We offer a solution to this in & 3.3. Equations (5) and (6) imply that pressure directly controls the kinetic energy and temperature of the atmosphere. Under equal solar insolation, a higher surface pressure (due to a larger atmospheric mass) would produce a warmer troposphere, while a lower pressure would result in a cooler troposphere. At the limit, a zero pressure (due to the complete absence of atmosphere) would yield the planet’s gray-body temperature. If global air pressure (thus atmospheric mass) were just 10% higher 2.5 Ga (than today), then this would have offset the lower solar insolation from a weaker sun. I see no reason to invoke Lindzen’s Iris hypothesis as necessary to solve the 2.5 Ga weaker sun-warm Earth paradox. That does not exclude it of course as being operative on the Earth’s climate at all epochal times. I agree that the paradox really isn’t much of one, and that the Iris is liable not be the main reason why not, which doesn’t mean that it didn’t exist. Bill’s albedo hypothesis is a good explanation, and IMO Earth produced more internal heat early in its life. Other solutions to the alleged paradox also exist. Atmospheric pressure is probably lower now than previously in the Cenozoic. Pressure and density are probably lower now than back in the Carboniferous. Dragonflies with wingspans of 75 cm. (30 in.) existed back then (325 Mya). I doubt such large insects could fly in today’s atmosphere. It’s not the density that made large insects possible, it was the much higher O2 levels. The ground crawling insects were also much larger back then. The higher O2 content of the atmosphere permitted arthropods to grow larger. The air was probably denser as well, if only because of 35% oxygen rather than 21% now. But there could have been other differences in its chemical composition as well. Any water vapor removed from the atmosphere would immediately be replaced by the oceans. Hmmm … in Tahiti, increased pressure is significantly correlated with decreased temperature, not increased, so that would go against your hypothesis that higher pressure caused higher temperature. The water vapor content changes (thus lapse rate changes) in that local case. Higher pressure, clear skies, sunny day, warmer. Lower pressure, cloudy, cooler, in that local case. Wim pointed out that in high latitude (or altitude) winter conditions high pressure produces lower temperatures, particularly at night. This is easy to understand as radiative cooling. Tahiti is harder. Possibly the SOI, the Tahiti to Darwin pressure gradient that is actually one of the better ENSO indices. High pressure=trade winds=cooling. Higher atmospheric pressure definitely increases the kinetic ingeractions between molecules we measure as temperature. Adding CO2 to the atmosphere definitely causes some warming. Neither is the only game in town. I agree Willis. Lots more to question in relation to climate versus weather. For exampke, why is stratosphere warm?. Most would say ozone due to production via UV. But why is it warmer at the south pole in winter when UV is at its Minimum?. is it pressure from ozone formed by other mechanism such as recombination of oxygen or energy from uowelling IR or other…? I do like the zeller unified pressure relationships though. The problem facing “deniers” is not the content of their message. The problem is how to effectively disseminate the message of Lindzen and others on climate change to the public. CAGW activists find support in every major news outlet 24/7. “deniers” are left talking to themselves on websites. Where is a P. T. Barnum when we need one? Or a Second Coming. Mann and Gore are the modern day PT Barnums. Hucksters to the core. Always willing to scam $$ from some naïve fool. The problem, as Dr Lindzen point out, is that all the special interests including the oil companies have figured out how to profit or advance their political agenda from Climate Change fear-mongering at the expense of the general public. I am now getting confused by the word “Deniers”. To me “Deniers” are now those who are hell bent on denying reliable energy to humanity. Yup…that’s certainly true where I sit (Toronto, Ontario, Canada). Our most influential media (Toronto Star, Globe and Mail, CBC, CTV and TVO) along with the priestly academics and power elites thoroughly avoid any detached and reasoned discussion of the uncertainties surrounding the AGW/Climate Change issue. As a result the public is generally ignorant of how the “Enhanced Greenhouse Effect” actually works. They have no idea of where the science ends and the supposition begins. In Canada it appears most or all of the sceptic arguments have been effectively muzzled. How can we get this situation to change in Canada? Will the new government in Ontario be a catalyst for change in the public discussion and will this force the mainstream media to end its constant propaganda? The Liberal government was decimated…lost party status. There should be hope for change. 1st Brexit, then Trump, now Ontario….itstarts to add up. Its pretty much the same scene here in OZ (except for the Murdoch press) but the Fairfax media the Guardian, the ABC (national public broadcaster on both TV and Radio ), The Saturday Paper, The Monthly Magazine and the Quarterly Magazine all push the CAGW line as do the Universities plus the main opposition political parties the ALP and the Greens. … the ‘Early Faint Sun Paradox’ … refers to the fact that about 2.5 billion years ago, the solar constant was about 30% less than it is today, but the evidence is that the climate was not greatly different from today’s climate. “… certainly are parallels, and I’ve described these in detail in a paper comparing the two issues with respect to the issue as it unfolded in the United States during the 1920’s and 30’s. If anyone pooh-poohs Dr. Lindzen’s comparison of AGW hysteria and eugenics coming from the same political mindset, one only needs to see the Berkeley City Council’s calling for forced population control (“humanely stabilize” the human population) to counter-act Climate Change. That’s the exact same kind of euphemistic language city councils everywhere use when dealing with the animal control issue of feral dogs and cat populations that must be euthanized by shelters. Human population control = euthanasia. The Marxist climate change Left is exposed by their own words. Sounds like Berkeley City Council is signed up to Agenda 21. Apparently one can check if they are, I had a stab last night for UK councils but couldn’t find much. Some in Australia though. I wonder if Prof. Lindzen meant to say “2.5 billion” years ago in reference to the Faint Early Sun problem. The sun was about 23% less powerful then, not 30%. At one percent per 110 million years, 30% weaker would have occurred some 3.3 Ga. Discussion of the faint sun paradox generally considers the earlier eras of the Archean Eon, which lasted from 4.0 to 2.5 Ga. It was 30% weaker when it first stabilized as a main sequence star, so let’s say 4.54 billion years ago. Total Solar Irradiance at Earth has increased by very close to a straight line (30%) since that time. 2.5 billion would be 13% weaker. 13% is a big number though. The Earth could still have the same temperature as today if Albedo was 15% rather than 29.8% like today. I was working backwards from now, so thanks for the correction. Which makes my question even more relevant. Prof. Lindzen must have meant 4.5 Ga rather than 2.5 Ga.
IMO the supposed paradox can be largely if not completely explained by greater geothermal heat. But your albedo suggestion is also liable to play a big role. However, 2.5 Ga was shortly before the first Snowball Earth episode. More ice would have increased albedo rather than decreased it. I think the early Earth was mostly ocean and there were no large continents yet. And the ocean was red colored from the dissolved iron, which would have absorbed a lot more of the sunlight than our current transparent water. It wasn’t until significant volcanism (moved lighter materials to the surface above sea level) and plate tectonics started bringing those large island arc chains together that we had continents (and that time was about 2.5 billion years ago). In addition, now there was oxygen in the atmosphere which rusted the iron out of the oceans and increased its albedo. So by 2.5 billion years, you had mini-continents (that have higher albedo than oceans) and mini-continents that can now hold glacial ice (with 10 times the albedo of oceans) and a higher albedo ocean and now the faint young sun can’t keep Earth warm enough. I hadn’t considered the change in albedo from the ocean’s changing color thanks to iron precipitated out, making the red bands. Fascinating and logical speculation – I never contemplated the iron in early oceans – I wonder how the various albedos – land and sea – changed with the addition of eukaryotic and prokaryotic life? The comments on Wattsupwiththat are a continuous source of interesting questions, perspectives and skeptical approaches to understanding this mind-boggling planet so full of mysteries! The seas (or just sea) were probably coffee-colored before the iron rusted out. Oxygen couldn’t start building up in the air until first it had combined with iron in the ocean. As exemplified by the Paleoproterozoic Gunflint and Mesabi Ranges of MN. The Gunflint chert contains microfossils of cyanobacteria dating from 1.9 to 2.3 Ga. The ancient stromatolite colonies have been converted into jasper in the Gunflint Range of Ontario. The ocean wouldn’t have been red initially, that would only occur once the Iron had oxidised, it would have been black. While I agree that the albedo hypothesis contributed to solving the apparent paradox, and that early Earth was mostly if not entirely oceanic, it’s not impossible for sea ice to form even without continents. IMO greater geothermal output, both inertial heat from formation and more radiological decay, helped keep the oceans ice-free. Sea ice is not going to hang around at the poles if the Earth was mostly ocean. It will drift out in the winds and get pushed out by surface currents. There was sea ice, but it wasn’t a solid mass staying in place. I suppose that there would be polar transport of warm tropical water. Also, sea ice would exclude contaminants when forming, which would include iron before it rusted out. I do not understand why Prof Lindzen did not straighten him out on the fact that over history CO2 increases followed temperature increases. Steven Mosher, good to see you retired from retirement. I wander why all people (inclusive your person) always forget to say that CO2 has an INITIAL temperature effect, as measured in the laboratory. That is, before (at the Earth) instantly cooling processes follow that initial warming. Mr. Mosher displays a temperament most closely aligned to that of my 3.5 year old son. How many years have you been on this Earth Steve? That last sentence of Lindzen’s is the money quote many people do not fully understand. Prof. Lindzen notes that “almost every interest” is profiting from AGW except the “general public”.